Do you ever have those days where you really hope there is no one watching? The days where you slip and fall in the mud or do something so stupid you can do nothing but laugh at yourself. I seem to have those days occasionally. Those times are what really make life bearable when things on the farm or ranch just seem to go wrong. For instance, today was the classic definition of “Mondays.” Anything that could go slowly or break did. 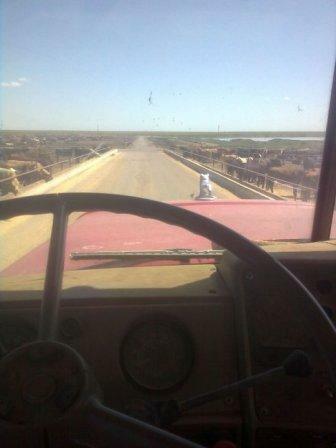 I thought I was never going to get out of the feedyard today, but we did. We have some 500-weight calves in the yard, and if it were a growing yard, we would be just fine. However, seeing as we are designed for larger feeders, we have to make some adjustments for these smaller cattle. Things like extra dirt to fill low spots along fence lines, stock tanks to provide extra water, and a special feeding regiment are all things required to house these calves in our yard. Days normally go just fine when there are two of us Receivers working, but today there was just me. The water truck has to be driven to several pens to fill the stock tanks in pens where the calves are not eating as well as we would like. Now, I have to mention that this is a Mack, and never in my life have I ever driven a semi with a standard transmission. So, it is safe to say someone gets a kick out of watching this 21-year old learn to drive a big stick. I have the first two gears down, which is all I need in the yard, but I have yet to learn the downshift. The only instructions I received was “you have to match up your speed and the gears to shift.” Uh, problem, I cannot figure where that point is exactly. I am still working on it. Secondly, since I am working by myself, and everything seemed to come up on the schedule today, I was running a little behind. So, instead of waiting on some help to water the pens, I just take off and do it myself. The water truck has a pump, which can be sped up by putting the transmission in a higher gear. Well, of course I am going to use a higher gear so I can water the pens quicker. Problem, this little hose only puts out so much water before it acts like a crazy snake you would see in a cartoon. Here I am, pointing the hose toward the stock tank, and leaning over the bunk rail to turn on the valve, and running over to the tank before water goes everywhere. You really do not understand how tempting it was to jump in those 200-gallon stock tanks while filling them up, unless you have been there yourself. As I go to turn off the hose, I run into a problem. I have to keep hold of those hose so I do not get wet, but also keep it pointed away from the feed bunk so not to spoil all of the feed. Just as I get to the truck, the hose falls out of my grip and water shoots everywhere. I just cringe and duck for cover but it was too late. Water was falling like rain and I was soaked. To make matters worse, I had the hose off the truck valve and was wrapping it on the truck rack when I hit the valve and had water shooting at me from knee high. To make matters worse, the pump was still on. Can you say water logged? All was well at the end of the day when I went to the tank to refill my truck. The feedyard has huge water storage tanks filling straight from the wells. If you sit in just the right spot in the shade of the tank, it feels like 60 something degrees any time of day because the water is so cool coming out of the ground. Work lasted several more hours, but I am sure the sight of me fighting the Mack truck brought a smile to someone’s face. Although, I really hope no one was watching. I am sure you have stories like this where you could do nothing but laugh at things going haywire. Share your experiences with everyone. If you make it a blog post, send me the link or leave a comment here or on the I am Agriculture Proud Facebook page. Yep Ryan, we all have days like that, but always remember, God has a great sense of humor and sometimes he just lets us squirm while he enjoys. Stay safe my friend, and you’ll have that truck whooped in no time.